My second dream of of making money online was based on the concept of Social Trading and it has been an interesting first month as well. 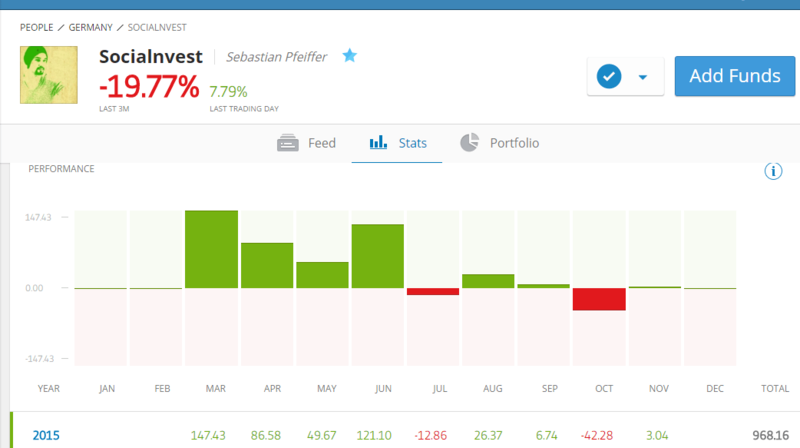 There are plenty of social trading platforms out there like Zulu Trade, Ayondo and Signal Trader, but I wanted to start by looking at the most popular and probably the most accessible platfrom, eToro. Again, there is loads to learn and I have had to stop myself from jumping in and investing my money, especially when I have seen the potential returns that some traders were making. However, I’m glad that I have actually taken a much more measured approach. 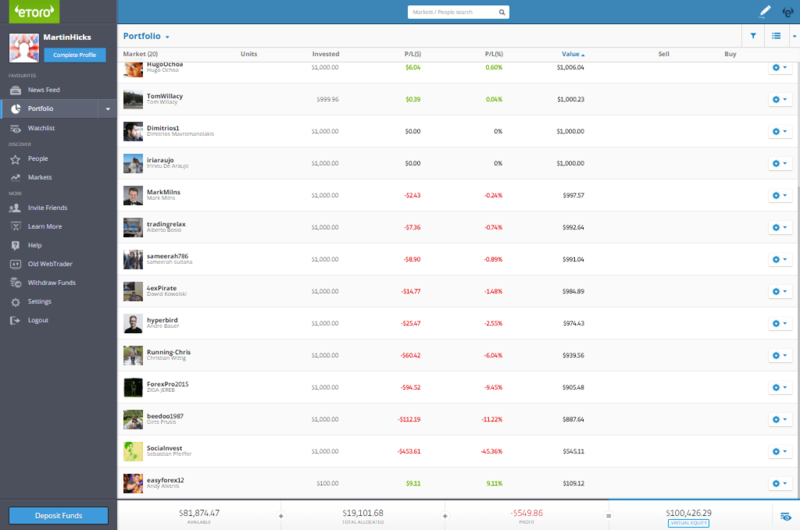 There are thousands of potential traders out there so choosing who to follow and potentially invest your money in can be a long process, but you definitely want to weed out traders who don’t match the profile you’re looking for. After a while you get a general feel from what the traders are like so I managed to whittle this list down to 20 traders who I wanted to ‘follow’. 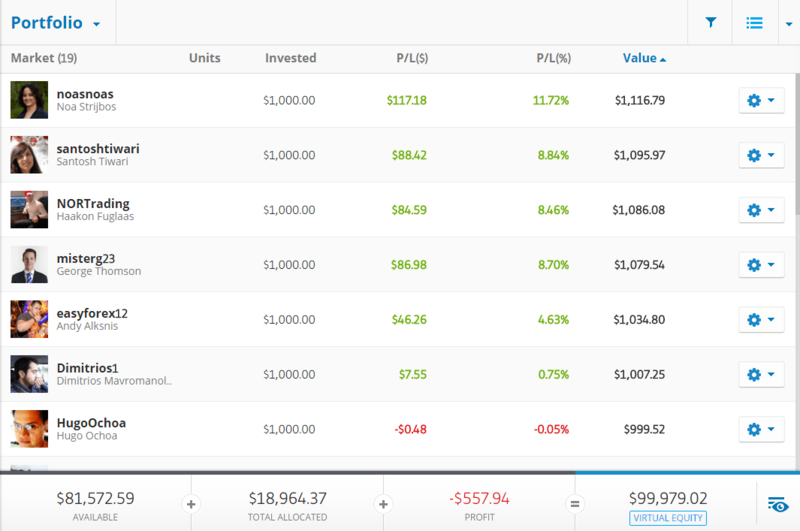 Then in my virtual portfolio I invested $1000 in each of the traders, and since then I’ve just been sitting back and watching their activity, although unfortunately, I didn’t get to spend as much time as I wanted on this activity. This guy Sebastian for example, had been making profits of over 100% in some months, which is an incredible return over the past few months and had accumulated over 2000 people copying him. My initial feeling was not to put this guy on my list, as he wasn’t very responsive in the community and had a high risk level, however, most of the other traders I chose had a risk level of 7 or below, so I thought I’d take a punt on him. All was going well, until one day when I checked my account I noticed there was a $500 dollar loss. I couldn’t quite understand what had happened then I saw that this ‘Socialvest’ had managed to blow over 50% of the value of his account in one day. Wowsers! Luckily for me this was only 50% of $1000 dollars of fake money, and my virtual portfolio was spread ovoer 20 traders, so the hit wasn’t too bad, but a lot of people lost huge amounts of money. This trader was managing over £300k of other peoples money so there were a lot of angry people commenting on his profile this month! But to be honest, more than anything this was a great lesson in knowing the risks involved and how steady low risk growth is a lot better than going for quick win high profits. Whilst doing my research there has been a lot of bad press about Social Trading and I think this is an area where you need to be very careful and not try to grab the big rewards. However, I still think this is something worth pursuing so am going to continue to look into this and will extend my research period by a month so I can invest in the New Year.